I would opt for a different ribbon such as a pink polka dot one instead of the plain white.
" I would buy this produt again "
It's a great sugar bowl!!!! The size is just right for a tea party! Used as party favors for baby shower. They look so much better in person. Customer service was great too. A couple of them arrived damaged and they sent replacements right away!!!! Great! They are even more beutiful than in the pictures. Perfect for my baby girl baptism favors. PS I checked this favor in different websites and beau.coup had the best price! Display. Theme of shower, great decoration. Useful, find NO cons! Many people commented on how cute they were. Sugar and Spice, and Oh so nice! For this shower we held a diaper raffle; I wanted to do multiple drawings throughout the event leading up to the Grand Prize. These little sugar bowls made very quaint little "prizes" (favors really) for the guests. I was delighted when I received them. They were far cuter than I had anticipated. We had a great time, and the value was good. I was able to provide "prizes" to almost everyone well within the allotted budget this way. These little sugar bowls are too darn cute!!! Q:Can we order it without the text on the bowl? A:They are pre-printed and not available blank. Q:Does the box come in other colors besides pink? I want to get them for my baby shower but I am having a boy. A:This item is only available in the color as shown. Q:do they come in the clear box and already wrapped up nicely? A:Gift presentation includes a clear, display gift box, pink scalloped base with white trim, white-satin ribbon and bow, and a pink candy-shaped "For You" tag. 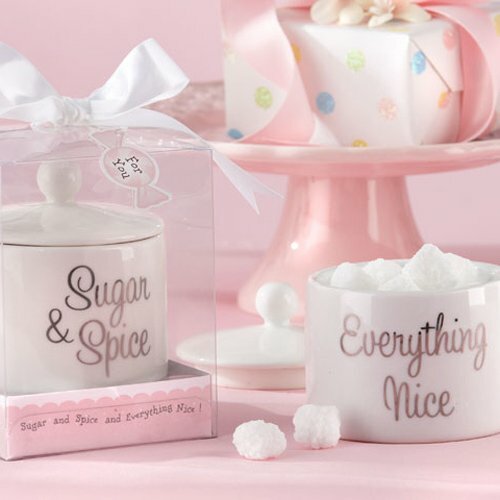 Celebrate the arrival of the new little girl with these ceramic sugar bowls, that have "Sugar, Spice, and Everything Nice" written all over it, just like her! With every sprinkle of sugar with your guests' morning coffee, they will be reminded of the sweetness the little girl holds. Ceramic sugar bowl comes with a lid and has "Sugar & Spice" on one side of the bowl and "Everything Nice" on the other written in silver. Gift presentation includes a clear, display gift box, pink scalloped base with white trim, white-satin ribbon and bow, and a pink candy-shaped "For You" tag. Add more sweetness to your baby shower; try our plastic baby block favor boxes and fill them with personalized baby shower hershey's chocolate or custom designer baby shower cookies.